Spring has sprung! 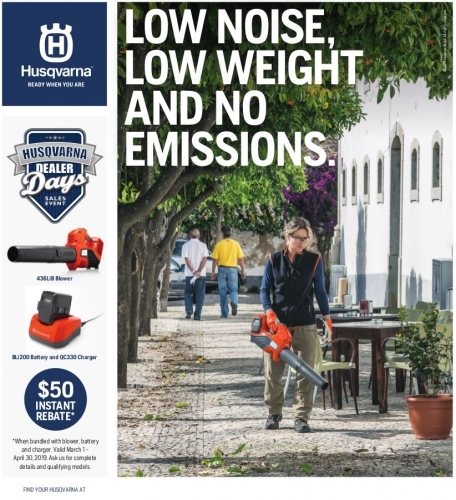 Get geared up for warmer weather during the Husqvarna Dealer Days sales event. Blow through your outdoor work. Visit us during the Husqvarna Dealer Days sales event! Offer valid March 1 – April 30, 2019. Not valid with any other discounts or sales. Do you have a need for speed? Race over during the Husqvarna Dealer Days sales event. Experience the amazing ride of a world-class lawn mower. Visit us during the Husqvarna Dealer Days sales event! Calling all landscapers! Come see us during the Husqvarna Dealer Days sales event. This is the best time of the year to fill your trailer with premium professional equipment. For a limited time, when you purchase a 525LS or 525LST string trimmer, you’ll receive a bonus 3 lb. spool of Titanium Force trimmer line. Get geared up for the 2019 season. Visit us during the Husqvarna Dealer Days sales event! Offer valid March 1 – July 31, 2019. Not valid with any other discounts or sales. Is your yard an untamed jungle? 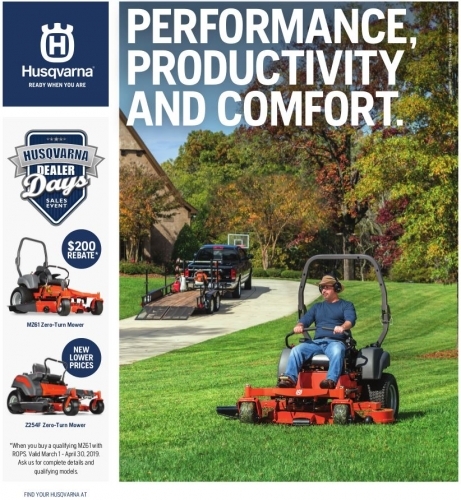 This spring, tackle the turf during the annual Husqvarna Dealer Days sales event. 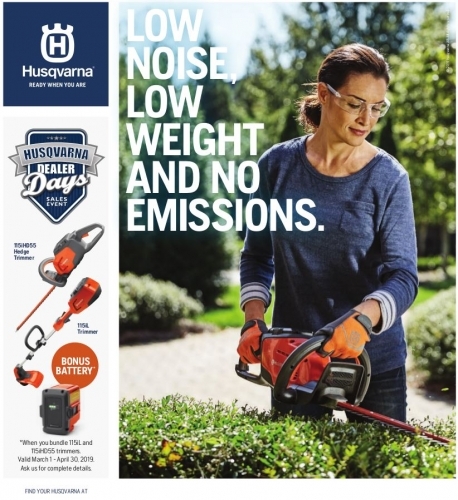 You can master your yard work with Husqvarna’s powerful and long-lasting battery tools. 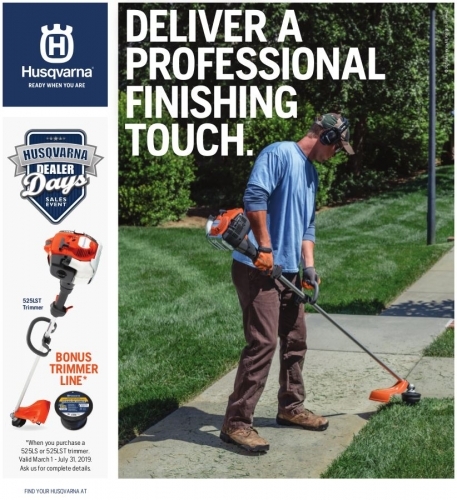 Visit us during the Husqvarna Dealer Days sales event! Offer valid March 1 – April 30, 2019.Not valid with any other discounts or sales. Tired of spending your Saturday pushing a lawn mower around the yard? 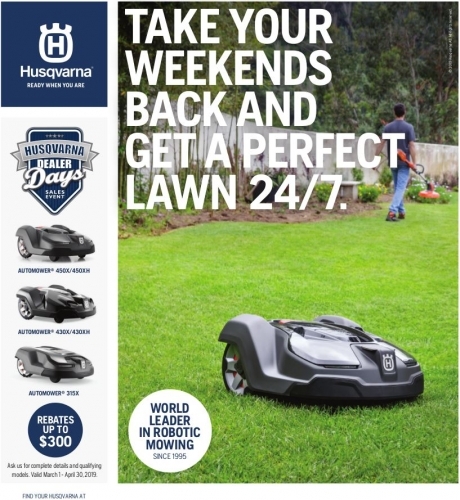 Stop by during the Husqvarna Dealer Days sales event for savings on the Automower® robotic lawn mower. Mowing your lawn is now as easy as using your smartphone or saying the word to your Amazon Alexa device. Visit us during the Husqvarna Dealer Days sales event! 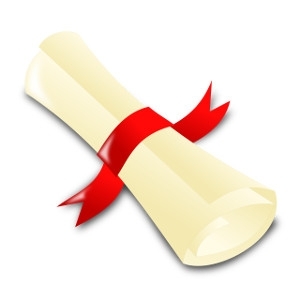 Congratulations to all our local 2019 graduates and their parents! 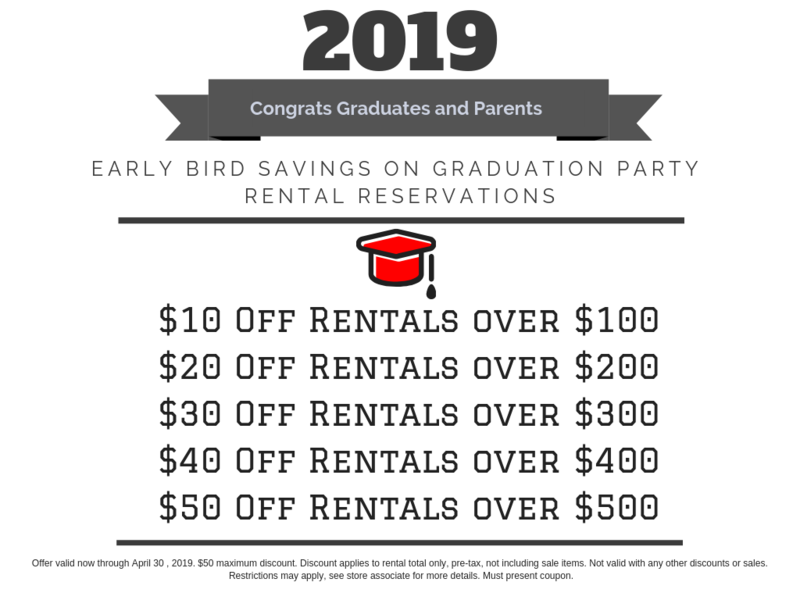 We are offering great savings on party and event rentals that are reserved now through April 30, 2019. Click here for printable savings! All party reservations must be made on or before April 30, 2019. Reservations require a 50% deposit to hold requested items, this deposit is non-refundable and non-transferable if reservation is cancelled. $50 maximum discount. Discount applies to rental total only, pre-tax, not including sale items. Not valid with any other discounts or sales. Restrictions may apply, see store associate for more details. 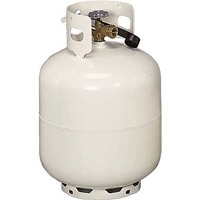 Take 25% off the refill of a 20# grill tank. Limit one coupon per customer. Must present coupon at time of purchase. Not valid with any other offer. © 2019 Taylor True Value Rental Center. All rights reserved.